I am going to start with a huge disclaimer about my review of this book. I didn't enjoy this as much as I expected, mainly because it wasn't the book I expected to read. To be honest, that is my own fault. 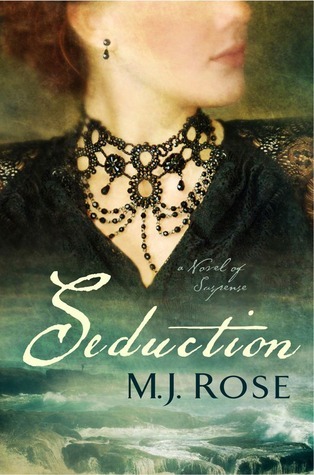 I have read a number of M J Rose's books before and liked them well enough, but after reading the third book in her Reincarnationist series I decided that was enough for me. It's not that I didn't enjoy the books I read but thrillers aren't really my thing and I am not invested in the paranormal aspects to a great degree, and so I felt it was time to let this series go. When the next book, The Book of Lost Fragrances, came out last year I stayed strong and didn't read it, just like I apparently didn't read the blurb closely enough when I was offered this book for review. I have a very clear memory of thinking that it was interesting that M J Rose was choosing to go in a new direction. I guess I was stuck on the references to Victor Hugo on the island of Jersey (I had no clue that he had lived there) and didn't actually read the rest of the blurb. Here's the thing though... the blurb and the cover don't really help considering that there is nothing in either that tells you that this is part of the Reincarnationist series. And that is a real bug to me because as a reader I prefer to read a series in order. I prefer not to find out that a book is part of a series when I read the second chapter and recognise a character name from the previous books. And yes, I am sure that there are plenty of people who would tell me that this is a standalone book, and it was to a degree, but there were still a lot of references to the events of the previous book. Anyway...enough of my ranty mcranty rant. How about the book itself? There are three strands in the story that link together over time to form the whole story. The first and most interesting to me related to the aforementioned Victor Hugo who was living in exile on the island of Jersey along with his wife and some of his children, and his mistress. Very cosy! It was while living there that Hugo becomes interested in trying to communicate with his daughter Didine who had died in a boating accident ten years before. He becomes more and more involved with seances and, in doing so, opens himself up to other paranormal experiences. Along the way, Hugo records all of his experiences in some journals, including his relationship with a young woman named Fantine. In the present day, Jac L'Etoile is asked to head to Jersey by an old friend. Theo and Jac shared an important friendship in their teens but they were separated and hadn't seen each other for many years. Jac is now a mythologist and she is intrigued by the Celtic links that are present in the ruins and the history of the island. When she gets to Jersey and Theo shares the Victor Hugo connection, she is even more intrigued and agrees to help Theo find the lost journals that could reveal more about the famous author's time on the island and also about the history of Theo's family. The final strand in the story concerns a Druid priest who is called upon to make an unfathomable sacrifice. The emotional trauma to his family presents through time as the characters relive their conflicts time and time again through history in each new identity. There is much to admire in Rose's writing. The language is evocative, drawing the reader to the past with ease, to the power of scent and it's role in memory and to the shadowy world of seances and ghostly presences. There is no doubt that the writing draws the reader into the story, building the tension as each new twist in the story seems to in turns ravel and unravel the threads in the story. The author must also be commended for not falling into the all too predictable trap of throwing in an obviously romantic conclusion. This doesn't mean that the ending isn't satisfying, because it is, but this is not a 'and they lived happily ever after kind of read'. Having said that, there were threads that didn't feel fully developed to me, particularly in relation to the losses that Jac was trying to coming to terms with, and I would have liked to have more focus on the historical stories in particular. If you enjoy a good thriller or like books that explore intellectual discussions of the paranormal realm with interesting historical settings, then this could be a book that you would enjoy. It wasn't a bad read for me, it just wasn't the book that I wanted to read right now. And I suspect that is actually a lot more about me than it was about the book! Good review, Marg. It's too bad you didn't enjoy this one as much as you'd hoped. I admit I didn't realize it was part of the Reincarnationist series until I started reading it. While this one can be read as a standalone, I wouldn't actually recommend it as, as you point out, there are lots of references to The Book of Lost Fragrances. I did enjoy this one even though paranormal isn't really my thing, but I think one of the main reasons for this is that I really like Rose's writing. Melissa, I like her writing and that's why I was a bit excited at seeing her handle different topics! Having said all that, I am planning to listen to the audiobook of The Book of Fragrances soon mainly because I have heard good things about the narrator!